The First Place students were reacting to what they had learned about the experience of being aboriginal during the Residential School era in Canada. The empathy they felt with the story of the abused students of their chosen school — Poplar Hill Residential School in Northern Ontario — showed clearly in the care and creativity with which they crafted their memorial tiles. 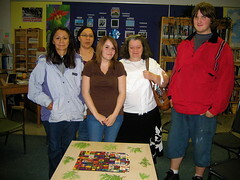 The competed tiles were smudged in a ceremony that included invited survivor Violet Kakekapetum from Sandy Lake First Nation. Click on the image to see a photoset from the event. The social justice component of their POH project saw First Place students poster downtown Ottawa in support of the campaign to find missing indigenous teens Maisy Ojick and Shannon Alexander.